with this very last article, I would like to inform you that this blog will be closed at the end of June. This decision was made for two reasons. 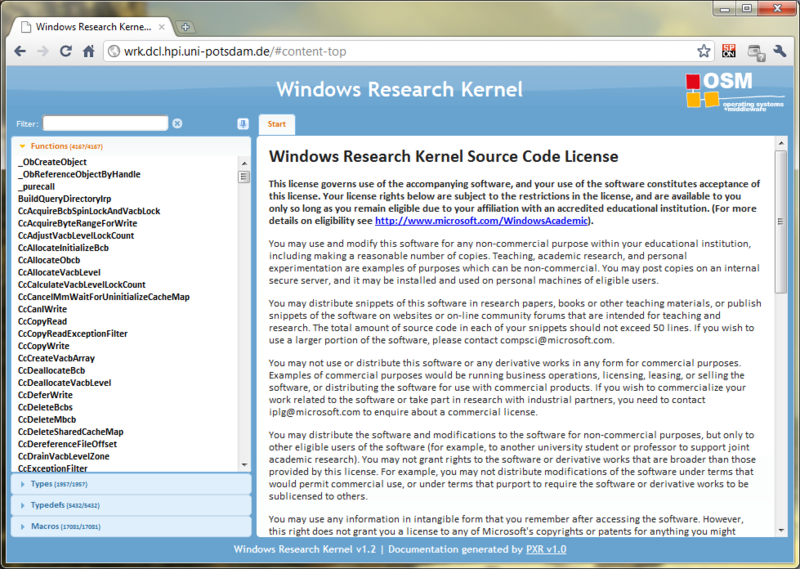 (1) The Windows Research Kernel was a great step from Microsoft towards academia. Together with its license the WRK enabled universities to use the Windows source code for their teaching efforts. Unfortunately, there is no news about next versions of the WRK, which makes it hard to study and teach new trends in hardware design, such as multi-core architectures, hybrid systems, and memory hierarchies, in the context of the Windows operating system and to share those insights via this blog. (2) With the submission of my PhD thesis, my affiliation with the HPI will come to a close at the end of the year. Nevertheless, we are going to maintain a static version of all the blog posts submitted so far. We will, however, disable comments for individual blogs. The transition to the static version should be completed by the end of June. In case you encounter any broken links, even past the migration time, please let us know via email. We use Hyper-V to run some of our WRK-related experiments. In order to keep management simple, I created a virtual machine that contains all the setup for those experiments. After creating that image, I used Hyper-V (running on Windows Server 2008 R2) to export this machine to have the template image ready at hand. Once this was done, I thought I would be able to import that image multilple times so that would have enough instances for running our experiment (30 in our case). However, when I imported the second instance, Hyper-V failed to import the template since the VHD file already existed. In this post I will explain how you can easily import multiple virtual machines from one single template image using PowerShell. The deployment of Windows Server 2008 R2 Hyper-V based virtual machines to facilitate our operating system course assignments has brought up the issue that virtual machines have to run at least Windows Server 2003 SP2. Since the WRK documentation says that Windows Server 2003 SP1 is needed to run the kernel, the question remains whether the application binary interface (ABI) of those two versions are compatible. As others indicated (thanks for your comments ) and evaluated on our server, the WRK appears to be able to run on Windows Server 2003 SP2. Nevertheless, I wanted to examine if at least the user-kernel mode ABI is compatible, for which I will give an answer in this post. Debugging the WRK on Mac OS requires two virtual machines (VM): the WRK VM, which will be used to debug the kernel, and the debugger VM, which hosts the kernel debugger. Both VMs will use their serial port to communicate with each other. In a previous post, we have shown for VirtualBox how to connect both serial ports over a named pipe. Now, we are going to describe how to configure VMware Fusion 3.0 virtual machines to accomplish the same goal. In a recent post, we introduced PXR, a cross-referencing source code documentation compiler. If you are interested in how the results look like and how it feels to interactively browse through the sources, the generated HTML files are now available on Microsoft’s Faculty Connection. We decided to publish these files in that way because we need to make sure that only eligible persons access the source code. Faculty Connection already provides this kind of service. In the meantime, we are working on a release of the PXR sources, so that you can start building a documentation of your own projects. For a recent project, we are going to host a bunch of WRK virtual machines with Hyper-V on a Windows Server 2008 R2 server system. When setting up the first virtual machine, we figured out that Hyper-V is only capable of running Windows Server 2003 with Service Pack 2 conveniently. That is, with mouse and network support! Since the WRK documentation says that the WRK should be deployed on a Windows Server 2003 (W2K3) SP1 system, we were not sure how to proceed. We finally decided to give it a try and the WRK boots in this environment and works—so far. We do not know, if there may be any compatibility issues between the W2K3 SP2 environment and requirements demanded by the WRK. To further investigate the issue, we will run a set of experiments to figure out, if the WRK continues to run smoothly with W2K3 SP2 and keep you posted. If you have any contrary or supporting experiences in this regard, please feel free to let us know. The start page generated by PXR for the WRK sources. One of our current topics is pushing the limits of operating systems. Inspired by Mark Russinovich’s article Pushing the Limits of Windows: Processes and Threads, we built a theoretical model for the amount of threads that can be created on a given system and then tried to reach these limits. However, the practical evaluation was kind of tricky and we stumbled upon an issue within CSRSS, Windows’ client server runtime subsystem. In a previous post, we showed you how to debug the WRK on a Mac OS system using Sun’s VirtualBox. However, in that post, I only concentrated on how to link both virtual machines but not on how to create a WRK-ready virtual machine (VM), because I thought that this task is well documented on the WRK DVD. Unfortunately, on the latest revision of the WRK DVD (verion 1.3, series F), this documentation is missing. In general, this is not a problem, as Microsoft provides a WRK-ready Virtual PC image on the DVD, where all the settings have been done already, but it is of no help, if you plan to use VirtualBox in your environment. In this article, we want to re-iterate over the steps necessary to run the WRK in your virtual machine. Taking place for the fourth time, the Microsoft Research Asia Windows Core Workshop brings together faculty from around the world and Microsoft kernel experts to provide information about and exchange experiences in Windows technologies for teaching operating systems. As the WRK and CRK community is pretty active in the Asia/Pacific region, we are extremely proud to be invited to give a presentation about our experiences with the WRK here at HPI. Here is the abstract of Alexander’s talk.